Can You See The Northern Lights In Big Sky, Montana? The Northern Lights are perhaps the ultimate natural phenomena. This dazzling display of dancing lights paints the night sky with vibrant greens, blues, reds, and yellows. It's an otherworldly experience to see the night sky come alive with an all natural light show. If you've never seen the Northern Lights, you need to add it to your bucket list. It's mind blowing. Did you know that you can see the Northern Lights in Big Sky? While it's not an everyday occurrence, the Northern Lights are most certainly visible in the great state of Montana. If you're in Big Sky Country, you might just catch a glimpse of the legendary Northern Lights. You just have to time it right. According to NorthernLightsCentre.ca, the Northern Lights or the aurora borealis "are actually collisions between electrically charged particles from the sun that enter the earth's atmosphere. The lights are seen above the magnetic poles of the northern and southern hemispheres." 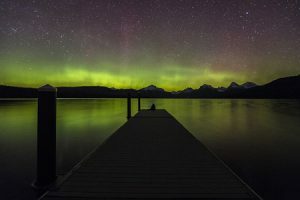 While many people head to Alaska, Canada, Iceland, or Norway to view the Northern Lights, it's also possible to see the Northern Lights in your home away from home aka Big Sky, Montana. The best time to see the northern lights in Big Sky is when the K-Index is high. According to FWP.MT.gov, "The K-index (Kp) is a measurement of the relative fluctuation in Earth’s geomagnetic fields. The higher the K-index (on a scale of 0 to 9), the better your chances of viewing the northern lights and seeing them at lower latitudes. For regions of Montana south of I-90, a Kp of 7 or higher is generally required to see the northern lights." Northern Lights Forecast & Aurora Borealis Alerts. After you consult the forecast, you'll want to check the weather in Big Sky. To properly view the Northern Lights, you'll want a cloudless night ideally around the time of a new moon. You'll also want to watch from a secluded place that's far away from any light pollution that also offers a good view to the north. Don't forget your camera and be sure to dress appropriately. Perhaps the best way to view the Northern Lights in Big Sky Country is to plan a backpacking trip that takes you off the grid. This way you can find the ultimate, panoramic vantage point away from any light pollution. Take a look at a map or chat with folks at the local outdoor retail shops who can help you find a perfect spot to watch the night sky come to life. When you see the Northern Lights in Big Sky, it's like you can reach out and touch the entire galaxy. Can you do that at home? It might be time to visit Big Sky. Do You Carry Bear Spray In Big Sky Country?